Each year, Inc. releases its list of the 5000 fastest growing companies in America. And each year, those companies prove they’re capable of some amazing things. The top 10 companies showed growth percentages between 13,927 and 50,059 percent in the last year. 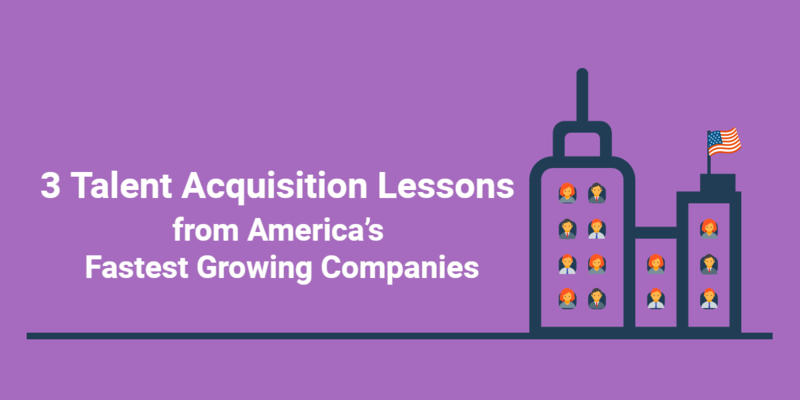 While they represent a wide variety of industries and locations, there are similarities in how they are approaching talent acquisition. When your company is facing rapid growth, it’s important to get things right. It’s your chance to find as many rock stars as possible and keep you upwards trajectory. 2017’s fastest growing company was Skillz. The San Francisco-based software company brought in $54 million in revenue, meaning that it grew by over 50,000 percent. The company is a gaming platform where players can play for free or pay to enter a game with a prize pool. But what’s interesting in Skillz’s growth is how it’s managed to succeed while maintaining a desirable workplace. The company encourages employees to play video games on their phone at least 35 times a week. People actually receive incentives if they play more than 50 times a week. While many employers might think this leads to lower employee productivity, Skillz has proven the opposite is true. The company decided to challenge preconceived notions about the work environment and as a result, they’ve created a place that is succeeding and making talent acquisition easier. Follow in those footsteps. Think about what you’re offering your customers. How can employees benefit from those offerings in a more interactive way? For example, if your company offers curated online education material, encourage employees to take time out of the workday to learn. This perk will help you attract talent who are interested in a core company value, giving you better fitting candidates. Coming in fifth place on the 2017 Inc. list is Halo Top Creamery. The company grew by 20,944 percent last year. Since the beginning of 2018, its sales have surpassed those of established ice cream companies like Ben & Jerry’s. What has set Halo Top apart is its unconventional take on a beloved frozen dessert. By using natural sugar alternatives, Halo Top has developed low sugar, high protein ice cream that averages around 240 calories…for the entire pint. In order to successfully disrupt an industry that has been around for ages, Halo Top needed employees who truly believe in the company’s mission. The same is true for all companies experiencing rapid growth. You need to look for people who are dedicated to the change the company is creating. This will help you identify employees who will be loyal and push the company forward. But how do you do this? Start by looking at your customer base. If a person is willing to pay for your product or services, then you know they believe in what you’re doing. Include job openings with your customer emails. This will help you tap into great talent that wants to help you succeed. The ninth most rapidly growing company was the Los Angeles-based, Greenspire. The startup helps to make homes more energy efficient and environmentally friendly. It also receives almost 85,000 job applications a year from qualified talent. One of the ways Greenspire has achieved this is by building a loyal and happy team. The company goes out of its way to recognize employees’ performances with attractive prizes. They also go on company dinners to build team camaraderie. The company is a place employees are proud to tell others about. As a result, word about the organization spread, and job seekers are eager to be considered when a position does open up. You can achieve similar results by focusing on the employee experience in your talent acquisition process. Ask your team about what they love about the company. Build on those foundations so employees will see that their happiness is important to you. Then encourage them to share their opinions online. This will help the company appear more attractive to talent. Have #jobseekers flocking to your company by creating a strong, collaborative workplace. Want to learn more about hiring for rapid growth? Watch our webinar!